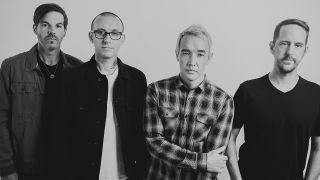 Hoobastank have announced that they’ll release a new studio album next month. The follow-up to 2012’s Fight Or Flight is titled Push Pull and it’ll arrive on May 25 via Napalm Records. To mark the announcement, vocalist and guitarist Doug Robb, keyboardist and guitarist Dan Estrin, drummer Chris Hesse and bassist Jesse Charlene have released a lyric video for the record's first single titled More Beautiful. Estrin says: “We’ve been doing this from day one because we love it. We didn’t do it for money or fame. It was our drug. Didn’t need anything more than that. Push Pull is now available for pre-order via PledgeMusic.